Here is rendition two of the fudgy shortbread cookie (see Shortbread Spice Squares). This one was my family's favorite. 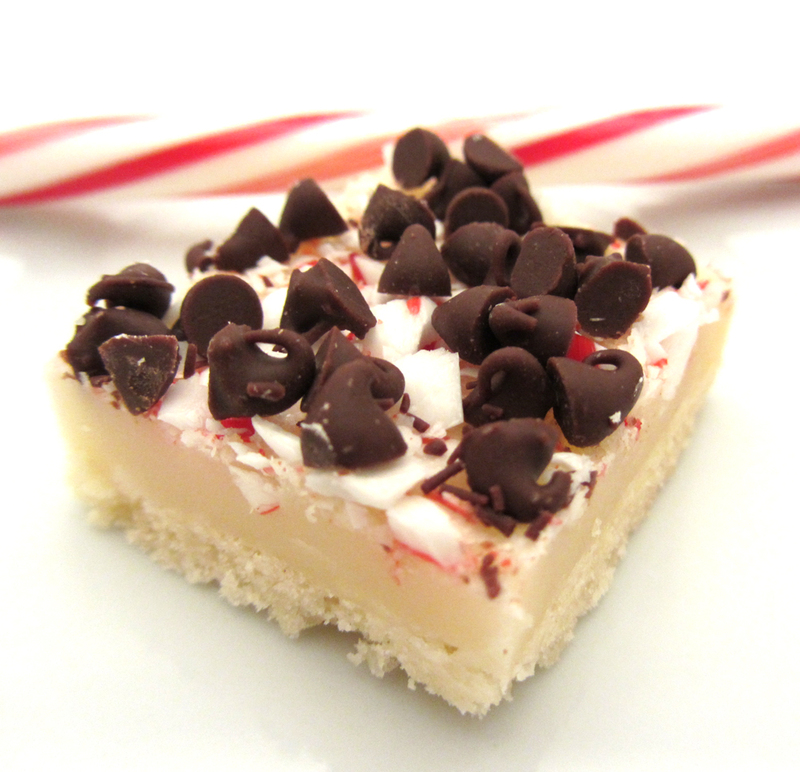 Buttery, tender shortbread paired with cool peppermint and semi-sweet chocolate. Mmm mmm! Holiday goodness! 1. Preheat the oven to 350°. Line a 9"X13" baking dish with parchment paper. 2. For the Crust: combine the flour, sugar, and salt in the bowl of a food processor. Pulse to blend. Scatter the butter pieces over the flour mixture. Process until the mixture resembles wet sand. 3. Press the crust mixture evenly into the bottom of the prepared baking dish. Bake for about 15 minutes or until the edges a just pale golden. 4. Meanwhile for the Filling: melt the butter in a medium saucepan. Turn the heat off. Add the corn syrup, extracts, and powdered sugar. Stir to combine. 5. When the crust is done baking, place the saucepan over medium heat. Bring the mixture to a boil, stirring constantly. Cook for 30 seconds, still stirring constantly. Pour the mixture evenly over the crust (tilt the baking dish as needed to fill to the edges). Sprinkle the mint pieces and chocolate chips evenly over the top. Allow to cool completely. 6. Cut into squares. Serve!